Chicken is easy to cook and it can go with anything like chapatti, naan bread, rice. Relatively it is low in fat and high in calorie. 171.0kcal is present in 100gm of chicken. Here I have an easy and delicious chicken recipe for you. Note down the ingredients for making capsicum chicken curry, it is very popular and easy to make. The recipe I have given here is for 2-3 people. Remember, if you have any doubts or problems, let me know. Add oil to the pan when oil becomes hot; add the chopped onion and saute for 3-5 minutes. Add grind paste to the onion. Add turmeric, chili, chicken and coriander powder and mix it well. Fry the masala in a medium heat for 3-4 minutes. Add chicken to the masala and again fry it for 5-8 minutes. Now add tomato to the chicken and cover it in low to medium heat for 2-3 minutes. Now add capsicum and again fry it till chicken becomes tender. Then switch off the gas and garnish it with Coriander/Cilantro leaves. 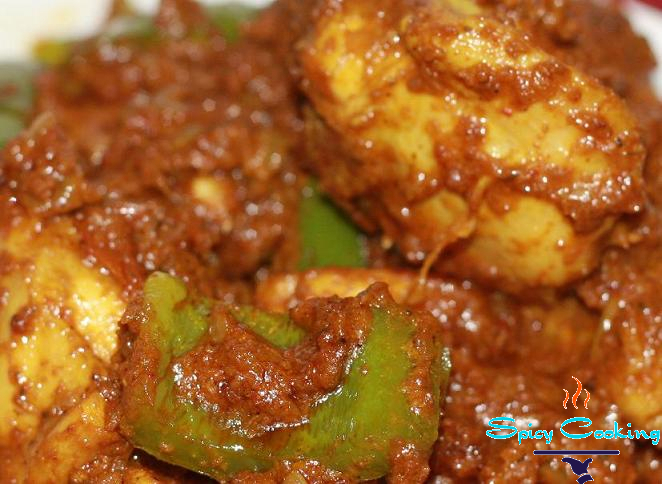 Now the capsicum chicken curry is ready to serve with rice, naan bread or chapatti. If you have any new chicken recipe ideas just feel free to comment here.